For a more traditional primo course, I decided to serve a pasta dish. The hubby loves ravioli and fall squash makes a perfect filling. I was excited to find red kuri squash at the market and planned to use that in my ravioli. Since I was challenging myself to a homemade meal, why not make the pasta dough from scratch? Sure, I’ve never done it before, but what could go wrong? Let’s just say, it was a nice luxury to have three other courses to count on just in case. I did some cookbook browsing and blog searching and found the proportions needed to make pasta dough. I settled on 4 eggs and two cups of flour. I knew I wouldn’t have time to make the dough, roll it out, and fill it on the party night. That meant making the dough the night before and letting it rest in the refrigerator overnight until Thursday. I pulled out a large, shallow bowl for mixing (I was afraid the eggs would roll all over the counter). First went the flour, then the eggs into the well in the middle. I probably could have read a few more recipes for the proper technique, but I just dug in and starting mixing. The dough was interesting…and sort of wet and not sticking together as I kneaded. Solution? Add more flour of course! Problem? All the all-purpose flour was used up. My idea? Use the whole wheat flour that‘s still in abundance in the pantry. The result? Interesting. I wrapped up my ugly ball of pasta dough and put it into the fridge to rest. I figured it could think about what it had done wrong and the next day it would be ready to play nicely. On Thursday night during my pre-party preparations, I started by cooking the red kuri squash for the filling. I had peeled and cubed it the night before. Dealing with squash can be dangerous and you don’t want to lose a finger right before your guests arrive. A quick boil in salted water (about 12 minutes) results in squash ready for the immersion blender. An apron is essential in keeping your party dress clean! After pureeing I mixed in a few generous spoonfuls of my homemade ricotta cheese and a dash of salt. I set this aside and hoped for the best as I retrieved the pasta dough from the fridge. Since I don’t have a fancy non-stick pastry mat for the counter, I tore off some wax paper and tried to weight it down to stay in place. I floured the surface (I had picked up more AP flour on the way home) and pulled out my ridiculously heavy and generally unwieldy rolling pin. Immediately I could tell this was not going to go well. The wax paper was sliding all over the counter, the pasta was sticking to the rolling pin, and my hands were quickly becoming coated in dough. I called in the hubby to hold down the wax paper, but it was too late. It was already 6:35 at this point (guests coming at 7) and I needed ravioli! It was printed on the menu cards! So I rolled and stretched and pulled the pasta as thin as I could. I cut it into shapes closely resembling squares and placed a dollop of the squash and ricotta mixture in the middle. As I pressed a fork around the outside of each ‘free-form’ ravioli, I tried to talk the pasta into performing a miracle in the pot. I put it back into the fridge to rest until it was ready to cook. Here’s a look at the disastrous rolling adventure. As we were wrapping up the antipasti course, I went back into the kitchen to bring a pot of water to a boil on the stove. While that was heating up, I added a generous amount of unsalted butter to a skillet and turned up the heat. Once it started to foam I watched for it to start browning and waited for the nutty aroma to fill the air. At this point, the water was boiling and I dropped my ugly duckling raviolis into the pot and waited with anticipation. After a few minutes they rose to the top, ready to be smothered in brown butter and served. I put two raviolis into each bowl and topped with the brown butter. As I took the dishes to serve, I told the guests that I would not be offended if they decided not to eat the ravioli. I just needed them to smile nicely so I could have a picture for the blog. The hubby will eat any ravioli, so he dug in. I had to go back to the kitchen for a steak knife. Once you could get through to the inside, the filling was delicious! 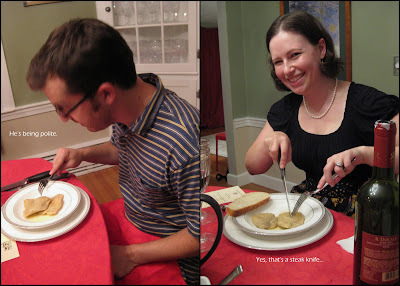 The ravioli were more like a pierogi or a dumpling. They were pretty dense. But often the cook is her own harshest critic. Maybe they were being nice, or maybe they liked the ravioli blobs, but I was the only one who didn’t clean my plate for this course. Until then, don’t forget to wear an apron and don’t be afraid to try something new in the kitchen! I know that you're saying that the raviolis didn't work out but they still look really good to me! P.S. How adorable are you with your apron and immersion blender! They definitely look good! I just give you props for trying out the homemade pasta. Other than gnocchi I haven't gotten up the gumption to do anything else! You are braver than most! I love that you tried pasta-making (for the first time) when feeding guests. That's awesome. I love making fresh pasta, and your raviolis look perfect. Well done! I've never made pasta from scratch, so good for you! And good for you keeping your cool. I've been known to crumple like a pile of leaves and cry when things don't go as planned! Still looks delicious - I'm sure you were just being tough on yourself!